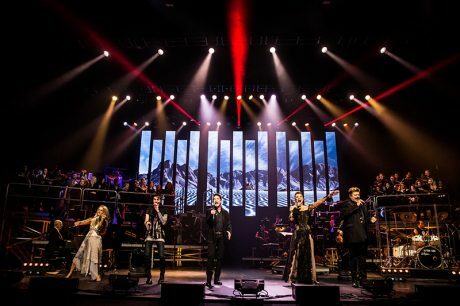 The latest concert experience to recently hit Broadway, Rocktopia presented song movements that combined classical music with classic rock in a colorful way that strived for a fluid synergy of the two genres. The 62-piece choir/orchestra/rock band ensemble not only linked the music together — for example, Richard Strauss’ “Also Sprach Zarathustra” led into The Who’s “Baba O’Riley,” and the “Gate of Kiev” section of Modest Mussorgsky’s “Pictures At An Exhibition” melded into U2’s “Where The Streets Have No Name” it allowed for different arrangements of some rock songs because of the increased instrumentation. 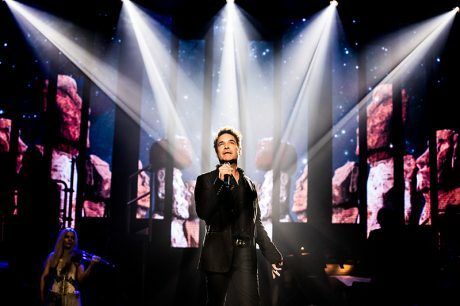 Rocktopia, which was created by singer Rob Evan and the show’s conductor, Maestro Randall Craig Fleischer, also featured singers Kimberly Nichole, Chloe Lowery, Tony Vincent, Alyson Cambridge and LaKisha Jones. The band included guitarist/musical director Tony Bruno, bassist Mat Fieldes, pianist Henry Aaronson and drummer Alex Alexander. Presumably this same cast will soldier on for a proposed national tour this fall. The Broadway run started on March 20 and ended on April 29, and singers Pat Monahan (Train), Dee Snider (Twisted Sister) and Robin Zander (Cheap Trick) all had individual guest spots running for several days. In the same way that the musical core of the show straddled genre lines, the technical aspects of the show also explored some new areas for those behind the scenes. It is not a standard rock concert, nor was it a normal Broadway production. It required an understanding of both for the cast and crew to make it work, as both production supervisor Russell Felton and production and video designer Michael Stiller attested when they spoke to PLSN. Each night, Felton and the crew had an hour before doors to check the systems, line check the band, sound check the singers and deal with any residual issues. Once the show began, he did not have a lot of cues to call as most of the show was run on time code. The spot ops called their own cues, while the board op had a few manual ones. The Broadway version of Rocktopia amped up the lighting from the road version, but it had slightly less video presence than the PBS show. Pat Monahan of Train was the first of three guest singers during the show’s run. With the Broadway configuration being an orchestra of 20 and a choir numbering 30, they chose “to divide it up in an elegant way that also made sense for musicians,” says Stiller. “There are things about an orchestra layout that you can’t mess with, although we do take more liberties than a lot of straightforward orchestras just adding in the choir.” The larger the orchestra and choir, the more limited the entrances that can be navigated, so Stiller let the producers understand this. For Broadway, the musicians were separated into two multi-platform sections, one on each side of the stage. The choir and orchestra sections at stage left and right were about 24 feet wide by 17 feet deep. Hidden stairs allowed performers to get up to the higher sections. “We wanted to fill it up vertically as much as possible to make it appear as grand as it could be,” says Stiller. Maestro Randall Craig Fleischer was not conducting at center stage, partly to not block the entrance, but also to skew the layout clockwise by a few degrees. 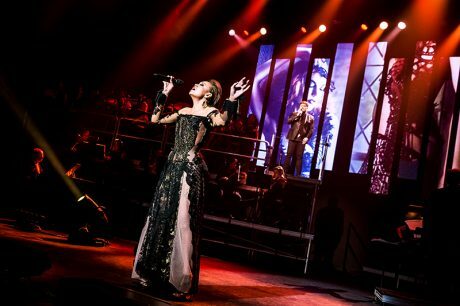 Opera singer Alyson Cambridge performs in front of an Axiom 5mm video wall from BML Blackbird. The video screen, described by Stiller as “this exploded array of strips,” was hung upstage center. “I like to take linear, rectangular video and chop it up into negative space between the strips, kind of explode it a little bit,” the designer explains. “The overall array was about 35 feet wide by about 15 feet tall, and it could be broken up any way we wanted.” BML provided their proprietary Axiom 5mm video panels. Singer/songwriter Chloe Lowery sings under textured light patterns. Beyond the 37 R2 wash lights and five RH1 hybrid fixtures from Chauvet, Stiller did “go back to one fixture in particular because he loves them.” He added in nine Martin MAC Vipers and 15 Vari-Lite VL3500s. “The Chauvet washes are great competitors for the MAC Aura,” says Stiller. They also utilized four Lycian 1290 2K followspots for key light. The lighting rig got a workout during the rousing encore of Queen’s “Bohemian Rhapsody,” which benefited from the big orchestra and choir support. “That got into this real crazy call-and-response lighting thing where we illuminated various people in different parts of the audience and on the stage,” says Stiller. 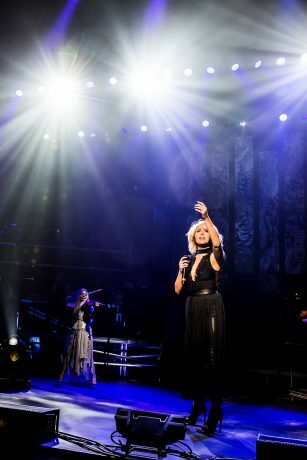 Singers Chloe Lowery (stage right) and Alyson Cambridge (stage left) each appeared in the fourth row for the beginning of that call-and-response part of the song before returning to the stage. To make sure complicated parts like this worked, the whole show was run with clicks and timecode. At the inception of the project, Stiller advised the creators that if they wanted the lights and music to be tightly synced together, that would be the best solution. The trick was to convince Maestro Fleischer to agree to it.